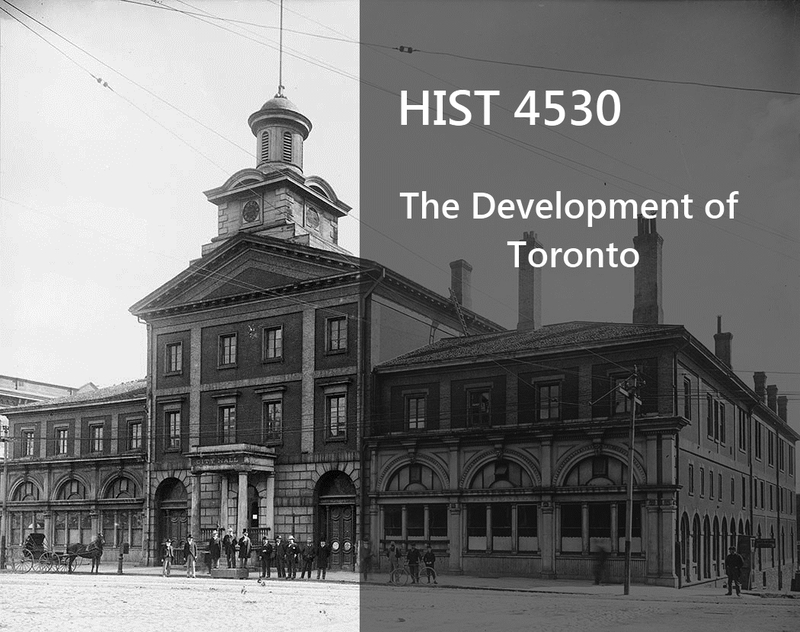 This fall, I am excited to start teaching HIST 4530 The Development of Toronto. This is a six-credit upper-level research seminar course on the history of Toronto with a maximum enrollment of eighteen students. The course aims to cover a number of different aspects of Toronto’s history, including environmental, political, social, cultural, and economic history of the city. Since the course only lasts for twenty-four weeks, I decided to focus our attention on the city itself as an object of historical study. As such, our chronological time frame is limited to the period of Toronto’s incorporation in 1834 through to its industrial growth and post-industrial development (and regional sprawl). We will briefly look at the history of this place before it was known as the City of Toronto, but our main object of concern will be its urban history in the nineteenth and twentieth centuries (with a look into its twenty-first century possibilities). I am also interested in getting my students out of the classroom, into the archives, and out in the field. As such, we will be going on a number of field trips, including visits and tours of some of our main local archives. We are booked to tour the Clara Thomas Archives, Archives of Ontario, and the City of Toronto Archives. This will hopefully introduce students to some of the main repositories for primary source documents relating to Toronto history. Students will have a choice of two types of major research projects for this seminar. There will be a research essay option, which will require students to conduct original primary source research on any aspect of Toronto history. Students can also opt to do a digital history research project that presents similar primary source research in a different manner. What form will that take? That will be up to the students. It can be a video or audio project, a website, a document digitization and annotation project, or anything my students can come up with. All the digital history projects must have some kind of web presentation component. Finally, while most of the course will take place on campus at York University in the seminar room and in the field throughout Toronto, we will also be engaged in online discussion over Twitter. I will be posting all online materials, discussion questions, announcements, and anecdotes for this class on the #yorkhist4530 hashtag. I will encourage my students to do the same, especially as they begin to work their way through the course readings and their own research projects. For those of you who are not enrolled in this course but have an interest in Toronto history, you can take a peek at the Fall semester syllabus here (Winter semester syllabus coming soon). Also, if you know of a great online Toronto history project, please post the link in the comments section below and I will add it to our course Moodle site for the students to check out. This should be a fun course to teach and I am eager to see what my students chose to do for their research projects. Stay tuned! I’d like to mention a trio of online resources which students may peripherally find of utility when researching Toronto’s urban history and development. Maps can shed light on particular points in Toronto’s past. By contrasting maps (particularly the insurance plans) across time, one can derive a mental picture of how the urban fabric of a certain area came to develop… It’s my hope that the above three projects will help people discover and get introduced to what maps are out there. Thanks so much for sharing these links. I already had included your Old Toronto Maps website in my course list of additional resources, but these other two are very helpful.